HELLO! If you’ve found me from my video of this technique, you’ll note I wasn’t using Crayolas in the video. These are the crayons I used there , and they are a bit brighter and a bit smoother than the Crayolas. Love ’em. Crayons are something most households with small kids have more of than maybe anything else. In fact, it’s normal to wonder if there are more crayons in the entire world than anything else. The answer would be yes. That’s why there are so many awesome, fun projects out there for alternative ways to use crayons, because the crayon epidemic got so out of hand, parents needed to find ways to get rid of massive amounts of crayons at one time. I’ve done a crayon painting art project, and it was a huge hit, but I wanted to try my hand at something different this time, so I went in search of other crayon techniques and found this one. They almost look like reverse scratchboard, if that makes sense. 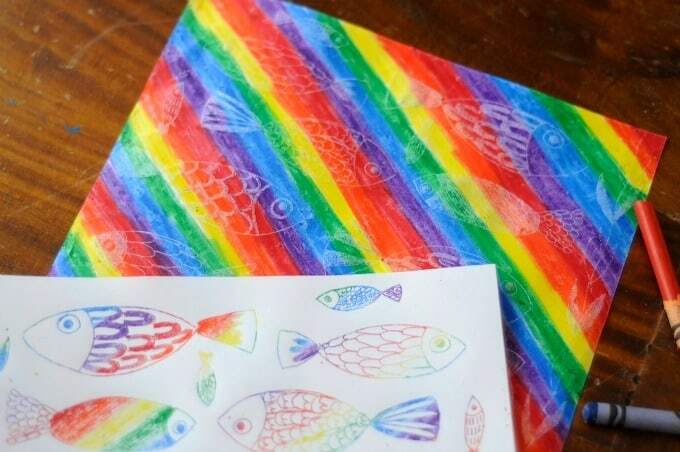 I did rainbow stripes and blobs, and the rainbow stripes are definitely the way to go. If you make sure the stripes aren’t too wide, you’ll get a good range of colors going on. Using a pencil or ball point pen, draw (press pretty firmly, but try not to break your little fingers) whatever you want to. 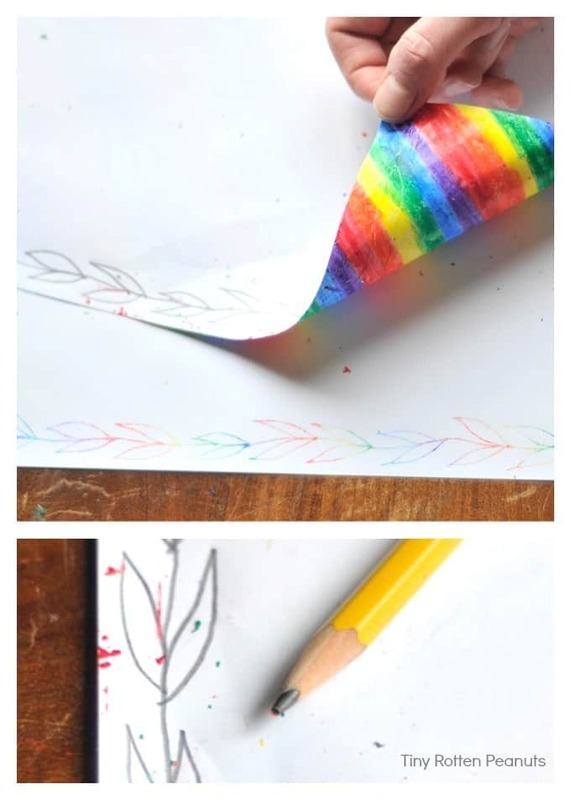 When you are finished, lift your crayon paper off to reveal the magic. I was inspired by some pinning I had done the day before, and wanted to draw a whole ton of fishies, so that I did. 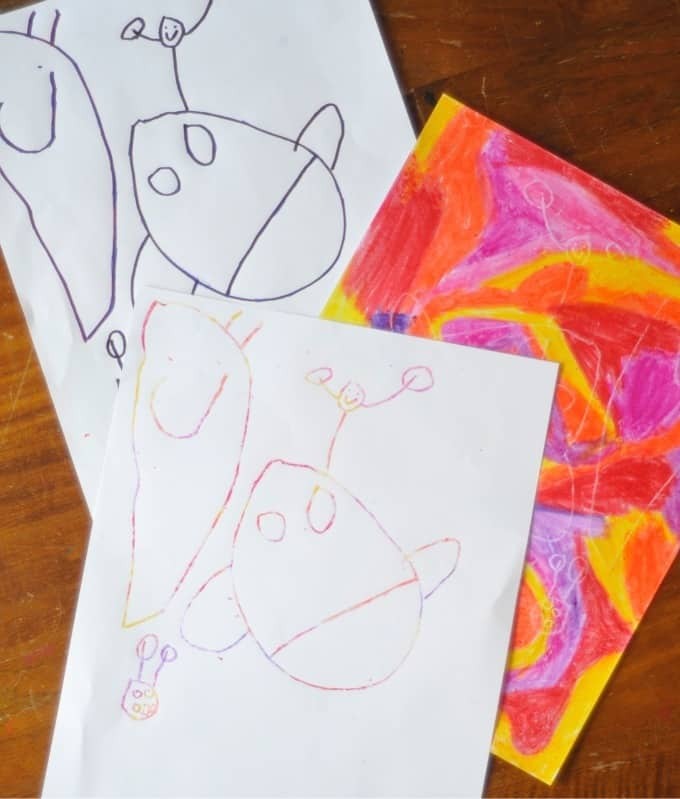 Next up, I drew over some of Beckett’s drawings to see how they would turn out on the blobby crayon background. They sucked and I should have left his drawings alone. I learned that with this technique, you need to get more detail and colored-in areas instead of just lines. But! This is what happens when you make art- you experiment and try different things and play around (all the same thing, written in three different ways because I’m so wordy.) Seriously, though- isn’t this the best part of art-making? So obviously I drew a fork and a cat-like creature next. I highly recommend this. 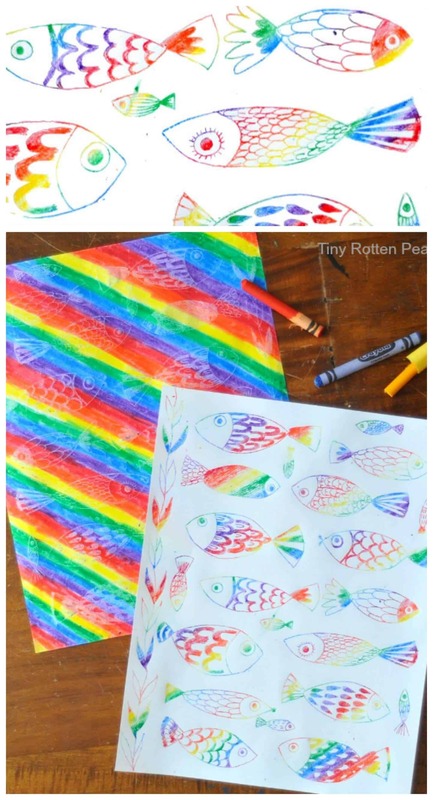 It’s fun, and it’s something you can do with your kids or by yourself when you are just sitting around looking for an easy art project to do. One of the best parts of this projects is how long it takes to fill the papers with crayon. As you are working, your mind will wander, your breathing will slow down, and everything will be right with the world. 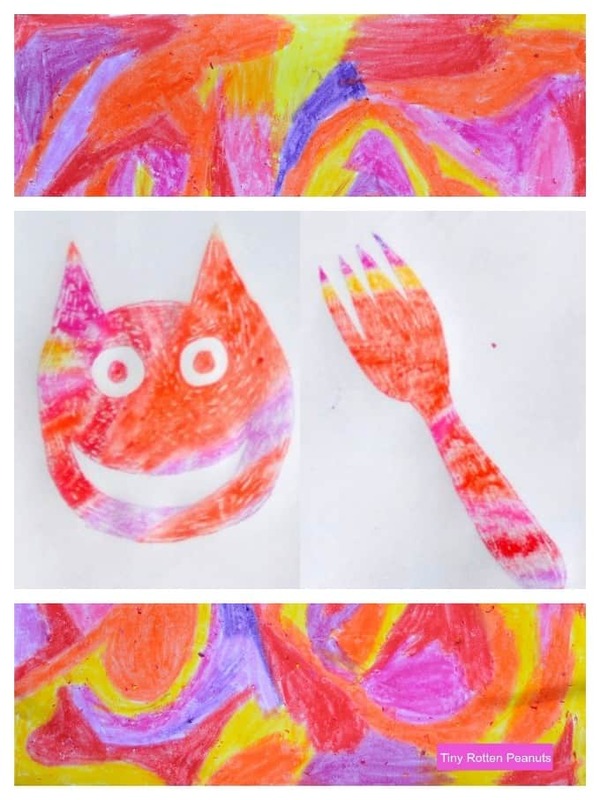 Now, go feast your eyeballs on these other crayon ideas, from some amazing, creative bloggers. Just lovely! I haven’t done this for so long – I think it’s time again. What great photos! Time to bust out the Crayolas! Thanks for sharing. Thanks Crystal! I was a little excited to find this technique. Yep, bust out the crayons and go to town. OOOOH! I love this idea! 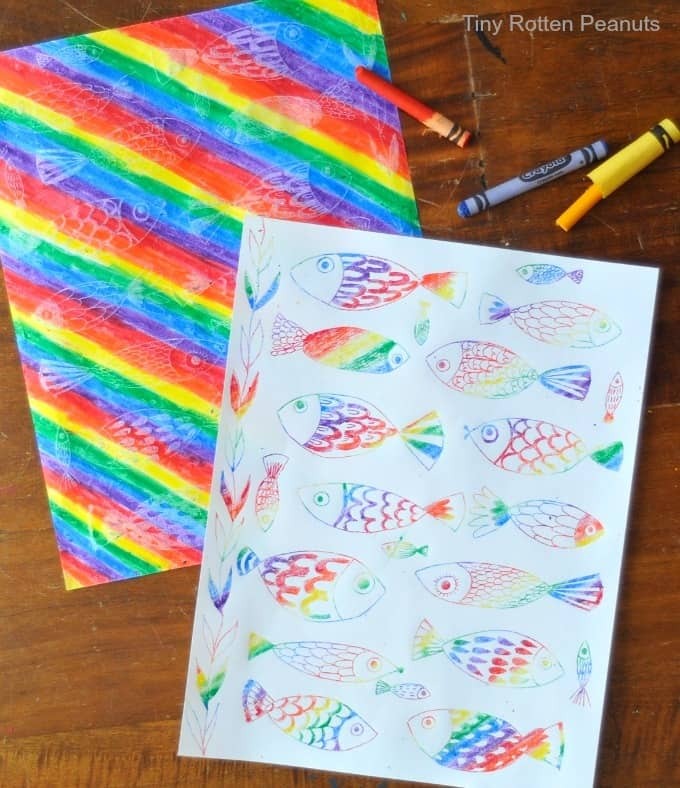 And I also love the fishies on the crayon paper- the more color the better I say! More fish! More fish! This was fun- your kids’ll love it at some point…. This is beautiful! I love this idea! Thanks Emma! Crayons are awesome. This is sooooo cool! And I love how the artwork looks great on both the transfer and the colored sheet! Thanks, Ana! It’s fun to get little art surprises like that. Great project! Our kids would love this. I’m so glad! I’m kind of getting a hankering to do another one already. I’m so glad you’re going to do this project! It’s absolutely fun. This is so cool. I have a 12 year old and she is going to love doing this during spring break. Looking forward to more post from you. What a great idea to do with my muppets on a rainy day! LOVE it!! Best thing is this takes no expensive or extra art supplies! Ha! Thanks Jeanine, I hope you try this out. that is SO COOL!!! Thanks!